Melidee loves vegetables and well anything healthy. When she comes to visit us she usually brings along celery and other such disgusting healthy things to snack on. Just teasing, celery is great (if you load it with peanut butter). I don't think any of us were surprised when she submitted this recipe for the Cooking Club this month. And it's vegetarian recipe! There is an option with chicken, so not vegetarian, which I did. And once again, the awesome picture is taken by Rachel. Parmesan cheese is a main ingredient in this salad, so be sure to use authentic Parmigiano-Reggiano and grate it yourself. Since this dressing is so flavorful, mild olive oil or even vegetable oil, rather than extra-virgin olive oil, works well. The classic preparation includes raw egg yolks, but because of health risks associated with using raw eggs, buttermilk is used. It adds a pleasant tang to the overall flavor and an almost identical egg-yolky richness. Pureeing the ingredients together in a blender or food processor is the best way to achieve the traditional thick, creamy texture. Blend all except the oil in a blender on high until smooth, scraping down the sides as needed...about 30 seconds. With the motor running, add the oil in a steady stream. Toss the salad ingredients with about 1/2 cup of the dressing. Serve...passing the extra dressing separately. Any leftover dressing can be stored in the refrigerator for up to 4 days. Season 1/1/2 lbs boneless, skinless chicken breasts with salt and pepper. Heat 1 TBSP vegetable oil in a 12-inch nonstick skillet over medium heat until shimmering. Carefully add the chicken and cook until lightly golden brown on the first side, about 5 minutes. Flip the chicken over, cover, and continue to cook until it is no longer pink in the center, about 5 minutes longer. Transfer to a plate and refrigerate until chilled...at least 30 minutes. Slice the chicken crosswise into 1/4 inch pieces and toss with 1/4 cup of the dressing. Arrange the chicken over the salad before serving. 3. The bread pieces must be baked at 350 degrees until golden. Adjust the oven rack into the center position and heat oven to 350 degrees. Whisk the oil, garlic, and salt together in a large bowl. Add the bread cubes and toss until thoroughly coated. Spread onto a baking sheet and bake until golden brown, 20-25 minutes. Allow to cool to room temperature before serving. Nearly any type of bread will make decent croutons. Avoid using distinctly flavored breads, such as pumpernickel, rye, and sourdough. These flavors may clash if you are using other spices or herbs. 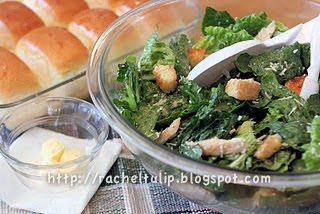 Homemade croutons make all the difference between a good salad and a great salad! So please, join us! Enjoy these new recipes and leave a review if you do. I would love to feature you. I always love new recipe ideas! I've never made croutons, but I love them--so I love this idea! Home made croutons? I'm in! But I will have my wife make it for me. We have grilled chicken caesar salad night all the time. Our kids love it. I love that it is so easy and not many dishes to clean. Although I will admit I have never made homemade croutons. I need to try because we always seem to be out, but have plenty of day old bread around. If you want it to be vegetarian, make sure to use a vegetarian Worcestershire, or omit it!